The time between exposure to the virus and eruption of symptoms is called the incubation period. For chickenpox, this period is 10 - 20 days. The patient often develops fever, headache, swollen glands, and other flu-like symptoms before the typical rash appears. After a person has had chicken pox, the virus remains dormant in the body, in nerve tissue near the spinal cord and brain. It may reappear at any time in the form of shingles---or never, depending on the person's health. During an outbreak, only those who have not had chicken pox before are susceptible. 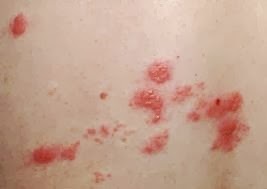 Shingles are infectious until all blisters have crusted over. If someone becomes infected by exposure to shingles, symptoms will appear in 14 to 21 days in the form of chicken pox. The symptoms of shingles often begin as pain or a burning sensation that affects a small area on one side of the body. This may be followed by a red rash four or five days later and then the appearance of fluid-filled blisters that break open and crust over, causing severe itching.